Estate: Marchesi di Barolo consists of 430 acres of vineyards located in the distinguished Barolo region of Piedmont in Italy. Their vineyards are in some of the most renowned areas of Barolo, including the prestigious Cannubi cru. 185 acres are estate owned, with 245 acres farmed by long standing relationships with family and friends. The family estate has been passed down from parents to their children for over 200 years and is currently headed by 5th generation winemakers Anna and Ernesto Abbona. They maintain the work established by their ancestors and value the great heritage of knowledge and tradition that allows them to continue crafting quality wines. Winemaking: Grapes are sourced from sustainably farmed vineyards located in the community of Maranzana in the Asti area. The soil is calcareous sand, clay, and rich in quartz. Aged for 1 year in Slavonian oak barrels. 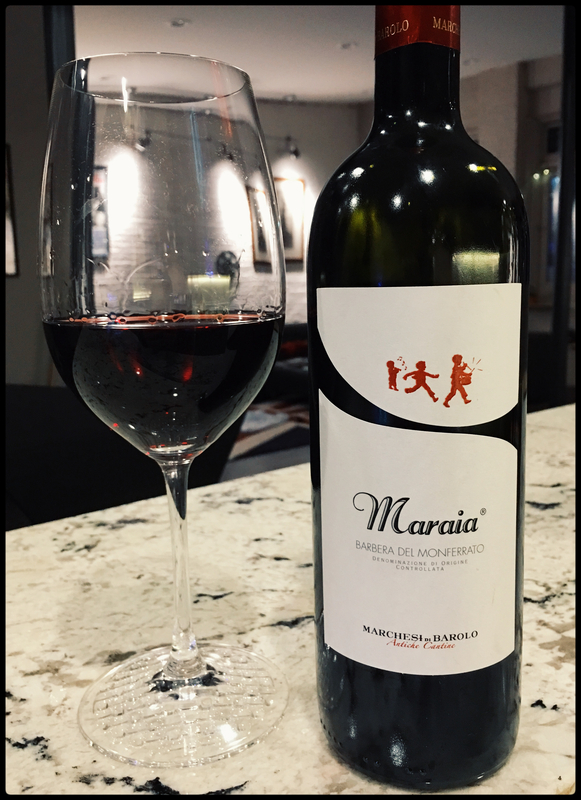 The name Maraia refers to “a group of rowdy kids, or ‘little rascals’, in Piedmontese dialect, referring to the lively nature of this wine”. Tasting Notes: Transparent garnet in colour with aromas of cherry, sour cherry, sweet wild flowers, and pepper spice. Rhubarb along with tart, sour and regular cherry interlace with silky tannins. Mouth puckering acidity backs tart blackberry and sour cherry on the dry finish. A bit too astringent for my personal taste, others may find it refreshing with fatty foods. Pairing Suggestions from the Winery: Pairs well with a wide variety of dishes, from antipasto to pasta with red sauce and light meals.